The high level of foot traffic and activity in commercial/industrial facilities can be great for business but tough on your building or property. 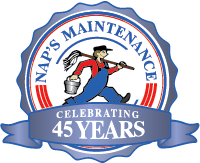 Nap’s Maintenance offers regular maintenance and deep cleaning to keep your business location or rental properties looking updated, clean, and marketable. Real estate agents — check out our home deep cleaning services!